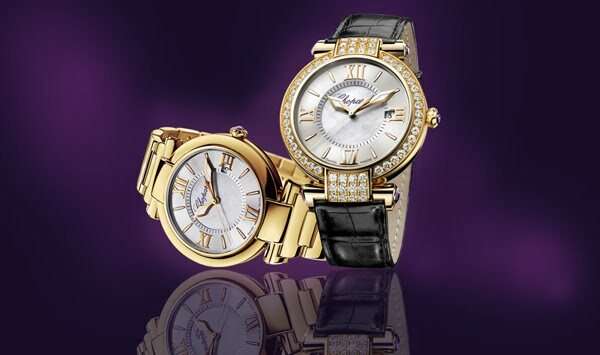 This year, at BASELWORLD, yellow gold makes its grand entrance into the watches of the IMPERIALE collection. A true classic from the House of Chopard, the IMPERIALE watch collection is enriched with yellow gold, setting off the perfection of its majestic lines to magnificent effect. The sheer wealth and finesse of its details make the IMPERIALE collection an eminently feminine model, and its timeless chic revives the spirit and the splendour of imperial classicism. Born in the 1990s and entirely revisited in 2010, the IMPERIALE radiates an appeal stemming first and foremost from its harmonious proportions and refined details. Endowed with a powerful and symbolic character, it asserts itself as the natural choice for women impelled by an all-conquering spirit. A wealth of details nod to the heyday of the imperial age. Roman numerals punctuate the dial and mark off the hours, while the centre features a delicately carved mother-of-pearl backdrop graced with motifs calling to mind the embroidered cushions that used to bear the royal insignia. This refined canvas is swept over by exquisitely curved hands evoking the sharp daggers used by sovereigns in combat. A crown delicately curved like a lotus flower and set with an amethyst cabochon is fitted to a case middle with sleek sides designed to give the model a lighter and more luminous glow. The shape of the lugs echoes the tradition of ancient columns that are famed for their perfectly balanced proportions.